Crazy Snook Catch During Storm Albert! These past few days in the New Smyrna Beach and Spruce Creek the bite has been not too good. Tropical Storm Alberto was on the opposite coast of Florida and we on the east coast have been receiving outer bands from the storm and that has been keeping most of the anglers inside. But when we get that break in rain we head out and try to catch a few fish. Today we caught a lucky break and were able to fish until around noon. There are lots of snook and tarpon in the backwaters due to the fact that these fish are moving into their summer pattern. The morning bite has been hit or miss, but the afternoon bite has been very good throughout the past few days. This morning was overcast and the winds were non-existent this morning. 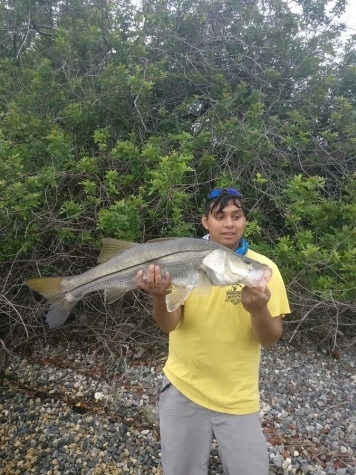 I caught three snook this morning and caught my PB on a Heddon Super Spook with a 2500 Shimano Stradic FK and a Cadence CR7 6-15lb Fast action 7'2. The majority of the fish I have been catching have been on subsurface twitch baits and swimbaits. The wind has made the water too choppy to really throw topwater. The redfish have also been hanging around the oyster bars but it has been a struggle trying to land them because of the oysters. After this tropical storm passes I am predicting that the snook and tarpon bite is going to get even better.